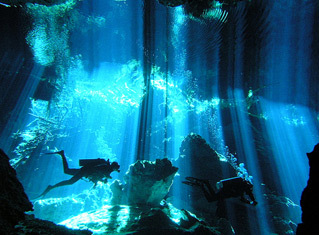 Dive in the crystal clear freshwater cenotes located in the jungle of the Yucatan Peninsula. This adventure requieres a minimum of open water certification. Dive in the cristal clear (250 ft. plus visibility and fresh water you can drink), cenotes of the yucatan peninsula, just north of the Mayan ruins of Tulum, that have been featured in National Geographic T.V. specials. Water temperature is 76° F all year long. We supply 3mm wet suits for all cavern dives and powerful dive lights so you get the full cenote experience.